Artistic rendition of the AlbertaSat weather satellite scheduled for launch on December 13th as part of the WB50 mission. 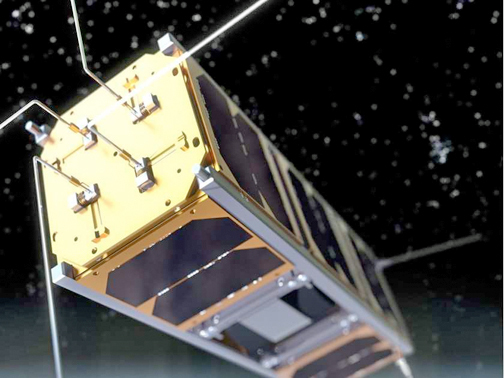 Claire Theobald, of the Edmonton Journal, posted an interesting story at the publication's infosite that spotlights the work of members of the University of Alberta and their AlbertaSat satellite. Students at the University of Alberta have been working on a CubeSat that will be launched into orbit with 50 other CubeSats as part of the QB50 mission. Each satellite is equipped with one of three sensors that will be dispersed through the Earth’s lower thermosphere to measure how the thermosphere is impacted by space weather events. The thermosphere is a layer of Earth’s atmosphere above the stratosphere and mesosphere, between 90 and 700 kilometers above the surface of the Earth, filled with atoms and molecules that absorbs large amounts of radiation from the sun. Space weather events, such as solar flares, can cause a spike in the density of electrons in the thermosphere. According to Jan Thoemel, project manager of the QB50 mission, these fluctuations in the density of electrons in the thermosphere can interfere with satellite signals and even change the trajectory of satellites in orbit. An example of the impact of these large space weather events on Earth was the March 13, 1989, geomagnetic storm that wiped out a large part of Hydro-Quebec’s power grid, leaving the province of Quebec without power for nine hours. 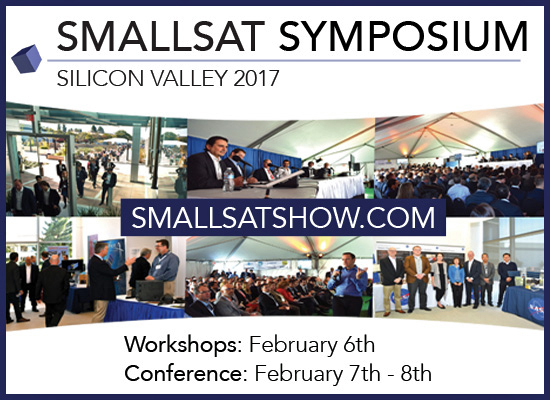 Within the smallsat community, those who hesitate in preparing for and planning their next business moves within this dynamic environment could well be "left behind." • Craig Clark, Founder—Clyde Space Ltd.
• Dr. Alex Saltman, Senior Vice President—GeoOptics Inc.
• Susan J. Irwin, President—Irwin Communications, Inc.
• Andrew M. Kwas, Engineering and Technology Strategist—Northrop Grumman Corp.
• Chris Lewicki, President and CEO—Planetary Resources, Inc.
=> Here's some particularly good news for interested parties — the first 100 registrants will qualify for a $200 discount on the standard event admission... take advantage of this offer... don't dawdle... and register now at this direct link.